We recently where involved in a coffee and food pairing. The pairing was run in partnership between the Coffee bloC at Buitenverwachting and the premier Buitenverwchting restaurant who supply the food to the Coffee bloC. Quaffee roasted the coffee and paired it with the foods that Edgar the chef prepared. The first pairing was a filter coffee brewed Yirgacheffe and a mini croissant with a mild cheese and quail egg. The brew and coffee was selected to bring out the cheese and egg combo since the citrus in the Yirgacheffe would highlight this. Quaffee’s Yirgacheffe had a mild lemon on the nose and hence this pairing worked well. The subtle tastes of the quail egg and cheese where complimented by the mild lemon. People were asked to try the coffee sans milk and sugar with this combo to start, and results were successful. The next pairing was a Burundi from Bututsi prepared as a cappuccino paired with a Sacherwürfel, which was small but rich. The pairing is a little more tradition as far as coffee is concerned and a comforting break. 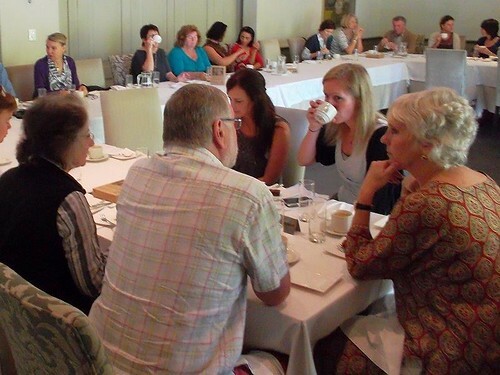 People could choose their way of enjoying the Burundi and it prepared the for the next Savoury pairing. A Mexican from Coatapec Rösti with Mushrooms & crème Fraiche. This coffee was also served as a filter coffee so that the mushroom and creme fraiche was highlighted in the dish. This pairing was like a wine pairing style like the first pairing. Once again the newer concept of Savoury pairing created a lot of interest and feedback was positive. Although we do not believe you need a time to drink grappa. The next pairing may have been a little early in the day for some. Buitenverwachting’s grappa was pairing with Quaffee’s Los Idolos served as an espresso. This combo was a classic and the Los Idolos made a great compliment to a well made grappa. All in all it was a great day with very positive feedback. We will consider being involved with this kind of thing more often.